BANGKOK—Discussing what he described as early stages of change in Burma, a senior US diplomat on Monday promised his country “will match their steps with comparable steps,” as expectations grow that Burma will release some of the country’s almost-2,000 political prisoners in the coming days. If the release happens, the US is likely to relax or end some of the economic sanctions levied against senior Burmese officials and business cronies. 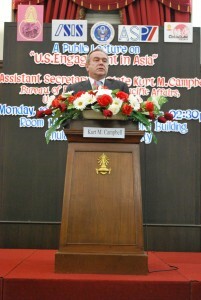 Campbell spoke at a lecture at Bangkok’s Chulalongkorn University, where he discussed US policy in East and Southeast Asia, saying that his country hopes to “shift resources and capability from the Middle East and South Asia to the Asia-Pacific region” over the coming years. Campbell departed for China on Monday night after acknowledging that “it will take a remarkable effort” for the world’s two biggest economies and growing strategic rivals to deal with the range of issues confronting them. He said that “Asians and Chinese need to invest more and purchase more products from the US” to help stabilize the global economy, which is under pressure due to debt problems and sluggish growth in Europe, Japan and the US. China holds an estimated $1.1 trillion in US debt, saying via state media in August that the US needs to “cure its addiction to debts” and “live within its means,” a missive that came just after credit “rating agency” Standard & Poor’s downgraded the US debt rating. In turn, the US argues that China deliberately undervalues its currency, giving Chinese exporters an advantage over American rivals. US senators last week voted through a bill allowing Washington to impose additional duties on products from countries that allegedly subsidize exports by undervaluing their currencies. With India hosting Thein Sein on Wednesday, after Vietnamese President Truong Tan Sang arrives the day before, China’s head-start in building new commercial and diplomatic links around Southeast Asia seems to be under challenge. Campbell spoke approvingly of India’s “Look East” policy yesterday, hinting that the US is involved in discussions about New Delhi’s attempts to forge closer relations with countries in East and Southeast Asia. Japan and India have joined the US in getting involved in the dispute over the South China Sea, where six countries have claims on maritime domain as well as on several islands said to sit near oil and gas reserves. China claims most of the sea for itself, but the US regards it as an international waterway, through which allies such as South Korea and Japan must ship oil and gas imports from Africa and the Middle East. One potential U.S-China flashpoint—where the US appears less-ready to confront China—is over Taiwan. Asked about the recent US refusal to sell Taipei advanced F-16 fighter jets, instead agreeing to hand over older versions of the aircraft, Campbell emphasized the need for “preservation of peace” between China and Taiwan, which Beijing sees as part of China but which has a defense treaty with the US. Despite refusing to sell the new model F-16s to its ally, last month’s announcement of a $5.85 billion arms package for Taiwan angered China, and Cui said on Monday that the sale would be discussed with Campbell in Beijing. “By putting these issues on the table tomorrow, we hope to better address these issues and prevent them from excessively interfering in the normal development of China-US relations,” he said.